Colour Therapy or Chromotherapy has been used as part of medical practice for centuries and is of great significance in the holistic approach of complementary health practice. The Colour Therapy Diploma Course gives students a thorough understanding of this practice, how to treat clients, and build a business. Colour therapists understand and use the energy contained in the vibrations of colour rays to promote health and healing. Following an introduction to the course, students learn about the history of the practice and brings them up-to-date with recent developments in this constantly evolving field. Here you will also learn just how popular colour therapy is, and explore how to use it to heal. Students will learn of the seven coloured cosmic rays, the nature and electromagnetic properties of light, and how we perceive colours. Here students will also learn about the seven colour levels, the metaphysical ascension of the mind, other physical and etheric planes, and the subtle body. The Colour Therapy Course provides students with information on the effects of colour on our health; physical, emotional, and mental, and how different colours can alter our wellbeing. We look at physical and emotional effects of colours by looking at how warm and cool colours affect us differently, as well as looking at the symbolism of colours within society. This module also looks at how colour is used throughout our lives and how to discover your colour season, to use when selecting clothing. The seven chakras are discussed, teaching students about the structure, location and function of each. With this underlying knowledge in place, the course talks about their links with colour therapy, as well as exploring the meridians of the body and their meanings. The Colour Therapy Diploma Course talks about the different ways that rays of light can affect our bodies and how this knowledge can be used in colour therapy. This discusses how natural light affects us, as well as the importance of the direction of light, and different colours of light. As a Colour Therapist, you will need at least basic counselling skills to empathise with and understand your clients. You will learn various methods of using colour to reflect the energy, health, life, and even body you (or your client) want. You will also learn about aura soma and colour therapy cards. Colour Therapy and Art Therapy can be used hand-in-hand to the benefit of both adult and child clients. You will also learn how to use colour as a diagnostic tool, based on colour psychology. Although not immediately obvious, Aromatherapy also works well with Colour Therapy, as each stimulate a different sense, making a powerful combination than either alone could. You will learn about some of the scents used in Aromatherapy and how these can be combined with Colour Therapy, to provide a synergistic and holistic session. Colour healing techniques used within Colour Therapy; teaching students how and why to use each, both for themselves and clients. 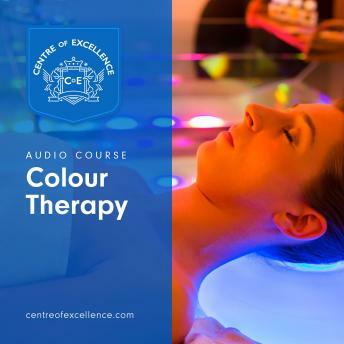 Students who are taking the Colour Therapy Course with the intention of starting their own business later, will enjoy learning about what you would need to do to set up a colour therapy practice. This course includes information on the different types of colour healing practice you could provide, and how to set up your space, brand your business, and attract clients.